You know, I was gonna say I this was another disaster.... but it ain't that bad. I had a few bites when I didn't have time for more, and it was just so-so, but I went back and found a cache of those cheesecake bits, and they helped hook me. See, both the cheese and the strawberry flavors are fairly tame, nothing crazy. So, when you mix those mild flavors with a nice size cheesecake bite in every other spoonful, the overall product kind of works. Nothing stupendous mind you, but it's decent. On Second Scoop: Back for more and this one ain't bad, especially without the guilt of a super premium fat content. 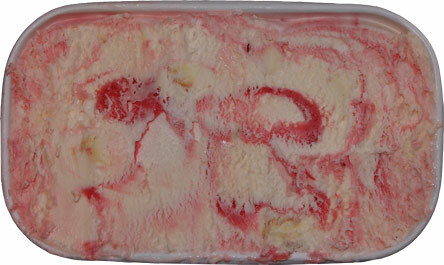 The swirl is a simple, tame, and abundant strawberry that works with the very mild base. Too many of these blast varieties beat your taste buds in to submission, but this one takes it easy on you. 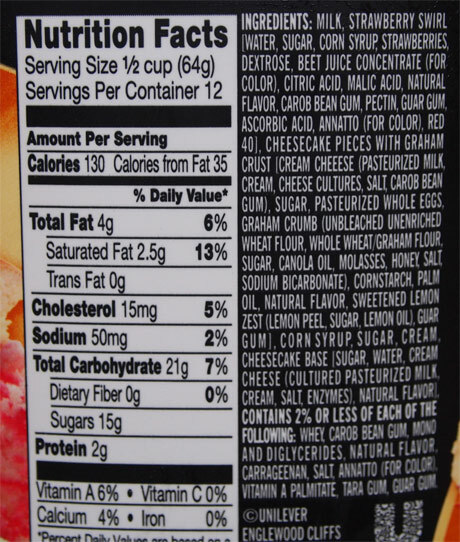 If you don't mind the ingredient list, their's no reason you shouldn't enjoy this one. I usually pass on the Breyer's blasts but they had a 5/10 deal at my Harris Teeter, and I wanted to give this one a try. I definitely liked it. The strawberry swirl is actually really viscous and tart, kind of like those little sundae cups. The cheesecake surprised me with how cheesy--in a savory way--it was, and the flavors definitely make up for the lack of the sweet cream flavor you get in the Blasts. I liked it very much. It is not too sweet and you can taste the cream cheese and graham crackers. O mannnn! I love this stuff. What a flavor! Apparently, I'm not the only one cuz I went back tonight and it was GONE!! The reg strawberry isn't cutt III ng it. This blast brand is nasty. The original taste so much better. 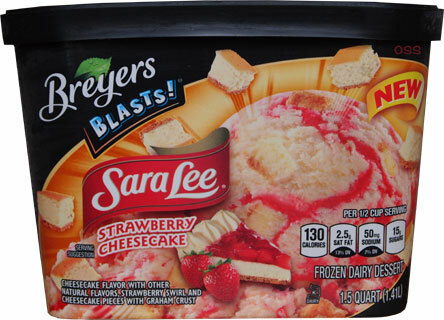 I purchased this particular ice cream because of the name brand "Sara Lee" and because I wanted to try something different. I thought that I was going to be in for a real treat! I hated it! And I refuse to eat another bite of it! The vanilla part of the ice cream is okay. However, the strawberry swirl tastes awful. It has an after taste as well. It tastes too artificial and not like strawberries or strawberry flavor (for that matter) would taste. Also, the chunks of supposedly cheesecake in it, tastes more like chunks of cake and sometimes pieces of cardboard. It was awful and I would not buy that ice cream again. If this is what Sara Lee has to bring to the table...they should stick with cakes and pies (their specialty). I thought this would be alot better. Not very many cheesecake chunks and i found myself fishing for them and avoiding scoops of icecream without them. Because honestly this strawberry stuff tastes like jelly you would put on toast. Not going to buy again. There seems to be a quality control issue with this product. I have been addicted to it but occasionally I get one that tastes like crap where the strawberry is too powerful or sour-ish and is more like raspberry-like. Overall when it's good it's really good. But when it's bad it's disappointing.